Comments: Winds were fairly light all day really, but seemed to pick up and die down with changes in the local cloud cover. I knew the sled was lightly built and shouldn't need too much air. This was its first outing. Would it stay open properly? Would it be stable with its two 1.2 meter tails of knotted loops? With May giving Aren rides on the playground equipment behind me, a gentle gust got the sled airborne. Out went a few meters of cotton test line. So far, so good! It does fly. Seeing it flying, my wife swapped child minding duties with me and let out a few meters of cotton line herself. Conditions were very light, and I think the kite was only getting airborne on thermals passing through the park. Having proven its basic flying ability on the test line, I switched to monofilament and had a few more short flights. After maybe 20 minutes or so there came a period of slightly stronger wind. This is more like it. Out went maybe 20 or 30 meters of nylon line and the little homemade sled ventured right up near the tall treetops, filled with the air that was blowing the leaves around just a few meters behind it. It rocked a little side to side, and tugged more strongly on the line than the diamond would with the same wind speed. After about 4 minutes, the wind died and it ended up on the grass again. Time to pack up. MBK Sled number 1 was flying at about 30 degrees to the horizontal, which is reasonable for a sled kite. However, I hope it will settle out at around 40 to 45 degrees with a bit more wind. Perhaps even 50 or 55 degrees with a bit of thermal help one day. Some other day, but for now we are happy that the kite is proven! The only thing we noticed was that it hangs left slightly, so I will be putting a strip of tape on the right hand spar to balance it better, when we get home. 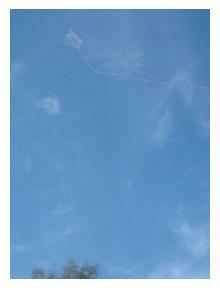 This kite is almost invisible in the air! It needs brightly colored tails I think. Maybe we'll make up a couple of tails from a red or green plastic shopping bag. Not as light as freezer bag plastic, but still reasonable. By the way, if you subscribe to our kiting newsletter, you'll be getting some construction details on this kite on the 31st of this month! Comments: We went out to the reserve again, this time armed with quite a few paper clips to add to the delta, should it misbehave. Well, misbehave it did. A few times it managed to climb high on 20 or 30 meters of line BUT... Its wind range was very narrow. Just a bit too much wind, and it would show some nasty flying characteristics! It would give the appearance of nice stable flight and then suddenly roll on its back and swoop all the way to the ground. A careful look at the sail showed that 1 side was billowing more than the other. Not much could be done about that. Also, 1 side had a bit more sail area than the other, so I pinched off a bit of plastic with my fingers to even it up. After a few more flights, in desperation, I added paper clips to the right spar to stop it looping left. Plus even more to the tail to keep it pointed up. All to no avail, it's just a dog of a kite! Longest flight was about half a minute, in perfect wind conditions. It's possible that it would fly reasonably well if extremely accurately constructed. Even then, one side spar might bend a bit more than the other! This prototype had less stiffness than the other 2 deltas. So it's back to prototype 2. With the fore/aft balance and bridle attachment point just right, it could turn out to be a useful little medium breeze kite. With the swept back side spars and cross bar a long way from the nose, this is a very rigid design. As such, it might even handle quite strong wind if constructed accurately enough! We'll see. Comments: With the forecast for windier weather today, we were hoping for a decent breeze. However, on arriving at the reserve we found conditions to be very light. A whole lot of cloud cover had moved in. This was accompanied by calmer conditions than had been moving the leaves around on the trees and bushes earlier in the day. Occasionally, the wind would gust up just enough to let out a few meters of line. We tried the latest Delta first, on the 17 meter cotton test line. It seemed stable at first, but after moving to one side too far it would gracefully do a half-roll and then dive to the ground. Ooops. Always to the left too, so I added some extra cellotape to the right spar about half-way along to improve the balance. This, plus a couple of paper-clips near the tail end improved its behavior to the point it got up 10 meters or so, but then the same problem. Sometimes to the right, so at least the left/right balance is right. I'm sure even more weight to the tail will result in a decent flying kite. No wonder flat deltas never got popular! The balance and attachment point have to be just right for them to fly at all. So it was back to the trusty little diamond. By this time, the wind had picked up just a little. After a few short flights we had the diamond dancing around in the air with more than 50 meters of monofilament line let out. 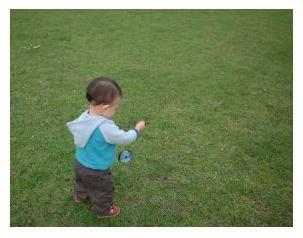 Here's Aren (17 months), flying the kite with his right hand. He's just dropped the reel with his left hand. It's in mid-air, just about to hit the grass! The monofilament line is barely visible, leaving his hand at about a 40 degree angle in the photo. Typical of kite flyers in his age group, he's more interested in the reel than the flying kite! A nice feeling, seeing a kite climb away slowly in light conditions with line spinning off the reel. This was a height record, so I will be describing the flight more on the Kite Altitude Record page! Much more line could have been let out, but at the risk of a tree landing if the wind died suddenly! So we played safe. Comments: A similar experience to yesterday, didn't bother with the cotton line at all. It's made me think that in very marginal conditions, laying out a lot of line and towing the kite up might work. Just for those occasions where you know the kite only needs that extra knot or 2 of average wind strength to stay in the air! You'll often see in print that there's no point in running along towing a kite. But if you are flying a very light wind kite outdoors, this is not necessarily true! Wind speed close to the ground always increases with altitude, up to a point. That's because it gets slowed down by stuff on the ground. Grass, fences, houses, trees. Sometimes a kite will only stay up when its well clear of everything on the ground. Comments: All 3 of us went out to the reserve, hoping for the best despite the nearly calm conditions. Got a few meters of cotton line out, but only managed to get the kite to hang briefly in the air before settling back down to earth. Right, time to attach some really light line and see what happens. With the 3 kg monofilament attached, things were more promising. After a few short flights I decided to tow the kite up higher to catch some of the gentle gusts that were passing through. With the kite and its tail carefully laid on the ground about 15 meters away, a firm pull popped it into the air and after jogging for a few meters it was at tree top height. Not a bad little light wind kite this one! Despite its small size. Freezer bag plastic and bamboo skewers are a good combination. Having waited until there was some movement of leaves in the tops of the trees, the little diamond hung in near tree-top level for a minute or 2. Gently wobbling from side to side as its long tail streamed out behind. Quite impressive, I really didn't expect much success on this outing. Even at the height of the tall tress surrounding the reserve, there just wasn't enough wind speed to keep the kite up. At least we saw it fly, and with no tendency to hang left. The added weight of 2 extra bits of tape on the right tip did the trick. Comments: Thought I would throw together a little diamond kite while working on delta number 3. Took it out today for its first test fly. It went straight up in the cold breeze, but turned out to have a tendency to go left. Sometimes right to the edge of its flying window. Despite this, it often corrected itself long enough to climb high on the line. A little bit of looping occurred during strong gusts, but that's to be expected. It's hard to be super accurate when making something on a small scale! I took care to balance the frame, so maybe the lop-sided flying is due to there being a bit more sail on one side than the other. Anyway, we'll see what a bit of extra weight on one side will do, next time we go out. On a kite this small and light, that just means sticking on a few short strips of cello-tape in the right spot. Aren had fun, flying the kite from his pram. He held the reel for a half minute or so, with most of the line let out. He seemed more interested in the reel and the cotton line nearest him than the flying kite! Predictably, he eventually let go, but the reel dragged through the grass at about walking pace. No problem to catch it. The line used was from the Baby Sled. It's down to around 17 meters now since I've been pinching some to use for bridles! A neat little clip made from a paper clip lets me clip the line to any of my kites now. Have decided to use this short cotton line for testing, then use the nylon monofilament later on to get some real height. Up to now, the standard way of adjusting a bridle was to tie a knot in it. This way, the attachment point can be shifted forward or back a bit. Not very neat, not very precise. So, I've invented the MBK Multi-attachment Bridle ;-) Basically, it's just a bridle with a series of small loops tied into it. Now, adjusting the bridle is just a matter of clipping the line into whichever loop works best on the day! Comments: Breeze was up, the sun out, so it was off to the reserve with the usual pram / toddler / kite combination. Once there, it turned out to be a frustrating experience. To sum it all up, I eventually got the kite trimmed to fly reasonably, but it seems the more swept-back design is very tricky as a flat kite. Even with generous amounts of tail. It spent a lot of time on its side, at all altitudes. It was fairly sensitive to the bridle attachment point position, but the paper-clips at the bottom made less difference. Interestingly though, it never looped in strong gusts, so my careful attention to accuracy and balance during construction did have some effect! Come to think of it, most successful flat kite designs have more sail area at the top than the bottom. Most obvious example would be the classic diamond kite, or arch-top kite. Even equal area, as in rectangular Japanese kites, works fine. Being a small kite, I don't want to add weight or complexity with a keel, so the next step is to go back the other way. That is, make prototype 3 even less swept-back than prototype 1! On top of that, refine my construction method even more to get the frame perfectly aligned and balanced, and we'll see what happens... When I get it perfect, I'll publish detailed step-by-step instructions, with photos, on this website. That way, you can share in my success if you want to!